There are times, when it is impossible to avoid conflict between the Revenue Manager and CFO (or Controller). At these times, the TRUST (that I have continually eluded to in several Essays) that develops between these two executives (as well as the GM and DOS). As the NFL season gets underway, this not only is a good time to reflect back on this time period, but also could provide some insights into an event that is uncommon and where great demand exists. 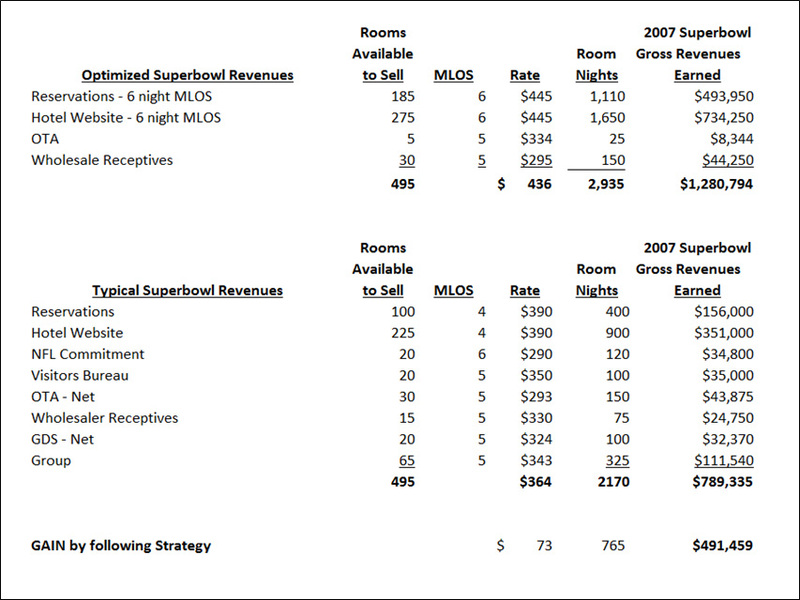 Many Revenue Managers (hereafter “RM’s”) have not faced a Superbowl. It is a time of great anticipation and excitement. For me, as perhaps one of the older hoteliers, I had lived through and learned the “harsh” lessons of three prior Superbowls (1999, 1995 and 1989), and so going into Superbowl 2007, I had a strategy in mind and confidence that my position would reap great benefit to my hotels from lessons learned. The problem was that the outside forces ALL thought I had lost my way! In the beginning I had to stand firm on my position, hoping for some buy in from co-workers. My fortune was that I had done well in my management of revenues and so I was given the latitude to go with my gut; despite the potential consequences. I never faltered in my thinking, although so many objections caused me to start to doubt myself along the way, and this is the story of what I believe is the strategy of when conflict in inevitable. As a younger RM my first Superbowls first saw a flurry of NFL phone calls to secure room blocks for the NFL. The next came from the Visitors Bureau who requested that I sign a contract with a large room block with them. And finally, calls from the major networks for their crews followed. The one thing in common was that they all were requesting large blocks and lower rates. As a rookie, I took the bait the first two times around. This would later haunt me in 1995 and 1999. Fool me once, shame on you…. The one thing that is assured in Superbowls is that there is tremendous demand and the second is that there is a limited supply of inventory to fulfill this demand. The demand extends to your food and beverage outlets and even lobby requests from advertisers who wish to set up booths and basically take over the “common areas”. My position was simple, of my 425 units in properties I immediately provided a sprinkling of units to the providers that had taken care of the hotel over that past year, and the only caveat was a bump up in rate and a 5 night minimum stay restriction. This accounted for approximately 15 units at each property and to this day, I believe it was well spent. (Needless to say it was important to remember to include Superbowl as a black out day on all contracts written for a Superbowl year). As I approached February 4, 2007 (Superbowl day; we were holding approximately, 395 units and all my channels were closed. Three weeks prior to the game I received a friendly call from one of the Market Managers managing one of the bigger OTA’s who asked if I had any room left that I would allow them to sell? When I told her that I was holding all my rooms, her response (I can never forget as she was also a friend!). She said “Richard, are you crazy?! You’re going to get stuck with rooms.” I did the right thing and gave her an allotment of 5 units in each hotel with MLOS restrictions. Several days later I met with the absentee owner of my hotels for dinner and he casually asked me how Superbowl reservations were going? Again, I said that I was holding all units until the final playoff games were decided. He looked at me, with a look you never want to see in the face of an owner; “Are you sure about this Richard?” I said, based on my last 4 years you have seen my record, I need you to please trust me on this”. Do I have to tell you that despite what I knew, I was feeling very alone? I could have taken the easy way out at that time and we would have opened and I would have lost nothing. After all, the way some look at life, taking the easy path and saving face is a safe way to live and “see another day”! But I don’t believe that the majority of we Revenue Managers have that option in our souls! I stubbornly forged ahead; risking all, but my prior studies and experiences gave me confidence… I had no fear in my heart. My written Action Plan to reservationists and the desk was that immediately upon the playoff games conclusion we would have two additional agents manning the phones and that we would open up with a 7 day minimum stay restriction and a good healthy rate. As that final preceding game before the Superbowl finished the victors were Chicago and Indianapolis. Both cities were in freezing cold climates and at least Chicago was a major city! We opened all inventory the moment that game ended at 1:00am that night. The first day came in at a trickle; perhaps 7 or 8 reservations; but we fielded many calls and the agents completed their “unrestricted demand (turn away) reports. I had tested the market that first day and felt the restriction was too ambitious, so I immediately lowered the restriction to 6 nights. That day, the dam broke and we were inundated with reservations. After three days I even raised the rate, but kept the 6 night length of stay restriction in place. We sold out in the two weeks we had TWO CHANNELS (Reservations and the hotel Website). The COST of these channels was minuscule. We fully booked our ballrooms and our lobby space. I offer the following chart to you to see the difference in Gross Room Reservations made in viewing one strategy compared to typical strategies. You can see the vast difference that holding inventories produced, with a $491,459 surplus in Revenues for the period. It may be hard to believe but this is the actual affect that resulted. Allow me please to make two final observations. I have always worried about the cities the Superbowl teams would be traveling from. If for example Tampa Bay made the Superbowl and my hotels were in Miami I thought the draw for the longer stays might be difficult. In the above case, despite staying with my gut feeling I worried a little about Indianapolis being a smaller city with smaller potential draw. As you can see it had no effect. Typical guests are coming for the time of their lives and enjoy the lead up week of activities. The anomaly would have been last year where the Superbowl was held in New Jersey where blizzards made traveling and events difficult. Here, I would have changed my Length of stay requirement because airlines and travel was so difficult. The activities were hampered because conditions were so bad that people wanted to get out of the New York area and because they would be hotel bound for so much of the time. So I would have to say that the warm weather cities (most of the time) would be the target for this form of Revenue Management. As another note, the next Superbowl in Miami in 2010 had New Orleans vs. Indianapolis. New Orleans had just been through a devastating hurricane and it made me think hard about the strategy. I stayed with it and can tell you that there was no affect. People from New Orleans came in droves and it was another successful optimized Superbowl with a six (and five) night minimum stay required. The last issue to the hotelier is the fall off of rooms on the Tuesday following the Superbowl, since the game is played at night most people stayed Sunday night. We offered them a bargain rate to stay an additional night and we picked up some interested parties. But the following Tuesday and Wednesday took time to fill and we were about 60%+ after. The amount of revenues generated, however during that preceding week made this a “non-issue”. In closing, the TRUST factor and COMMUNICATION between the Revenue Manager, General Manager, Sales Director and CFO (Controller) enabled me to use what I had learned in my hotel experience. I could have, of course been overruled. If you need support, feel free to use this essay! I am a 4 time Superbowler and I did well in all of them, but won TWO! I’m still waiting for my RING!! The future of Revenue Management leadership: What should Revenue Manager know?